Click on the image below to see more detail. Looking for the new masters’ of the 21 st century, best in fine art investments? You have found one here. Your best value, buy from a dedicated artist- buy from a reputable, established artist direct from his studio. Paintings that hang comfortably with the finest collections. A very unusual painting resulted from an invitation from Captain S.R. Sanderson who was interested in painting and First officer G. Sharp to join them and create an impression as they landed G-BJCU. This was in the happier days before Muslim terrorism so unlikely to occur again. 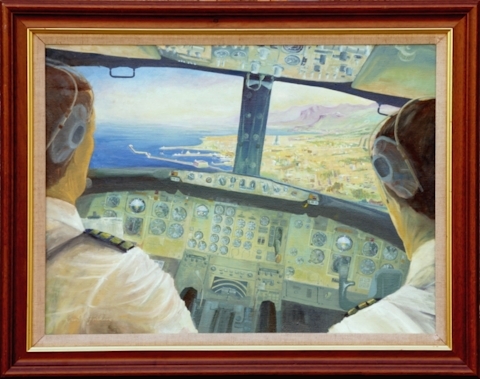 The moment shown is 13:30, 15th October 1982, flight BY 858A Gatwick to Heraklion. 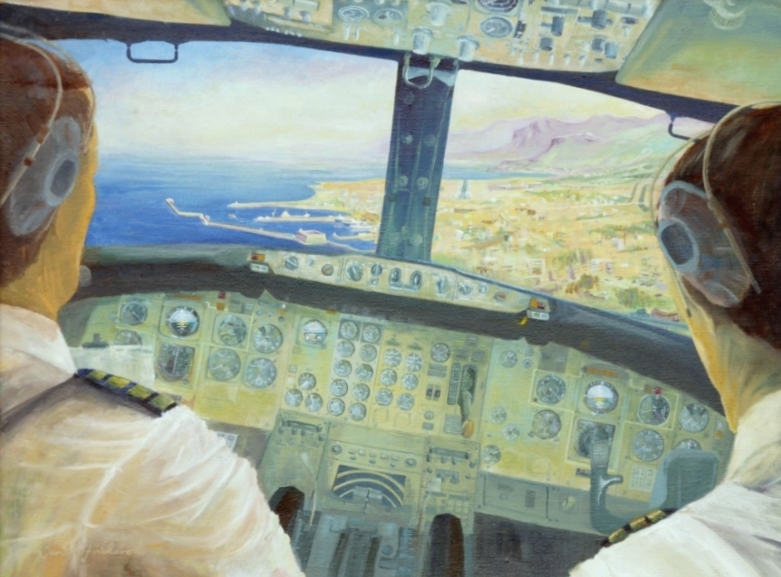 You are in the jump seat on the final approach on board a Britannia Airways Boeing 727, 700 feet up and 1.5 miles out from the runway and about to fly over the port of Heraklion. Thus the instrumentation show is entirely correct. I have a long interest in aircraft. I was raised near R.A.F. Biggin Hill, Kent. Having attended many a 15th September anniversary display I can still recognise many historic aircraft by the sound of the motor in particular the Spitfire, Hurricane and Me 109. I watched planes flying as diverse as the replicas of Louis Charles Joseph Blériot‘s monoplane, the first to cross the English Channel (July 25, 1909), the Red Baron‘s triplane, and many originals, the Avro Lancaster, Mustang, Harrier jump jets and Sea King helicopters to name a few. I remain fascinated by aircraft and would welcome an opportunity to paint more planes. Credit where it is due: Special thanks to: Captain S.R. Sanderson and First officer G. Sharp for the invitation to join then, Britannia Airways for the flight deck info, for inspiration and encouragement and the unrecorded friend of Captain Sanderson, a fellow captain who came to the studio with the flight manuals and patiently checked every single control setting by the book, gentlemen, I thank you for a wonderful experience. Best value, buy from a dedicated artist- buy from a reputable, established artist direct from his studio.